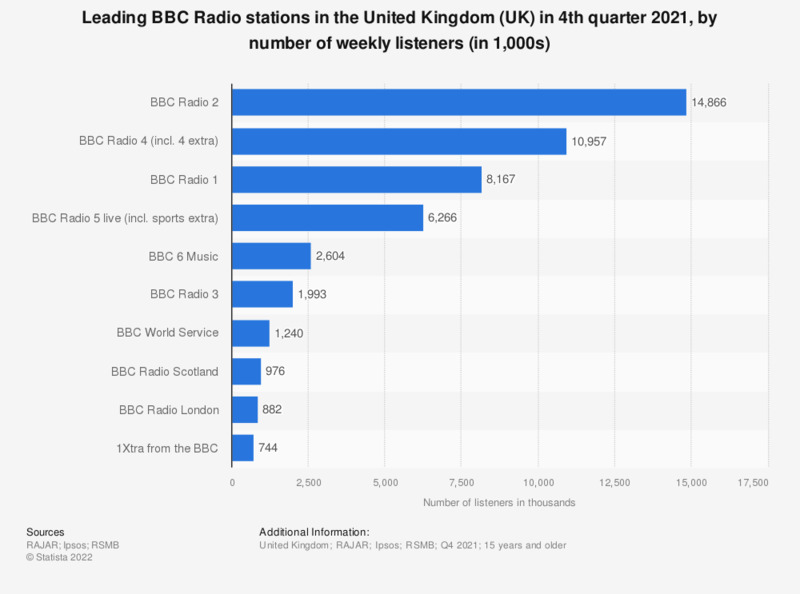 This statistic displays the top BBC radio stations ranked by weekly reach in the United Kingdom (UK) as of quarter three 2018. That quarter the station BBC Radio 2 ranked first in terms of reach with roughly 14.9 million listeners weekly. BBC Radio 4 and BBC Radio 1 ranked second and third with about 10.5 million listeners and 9.4 million listeners per week, respectively. * The source provides the following commentary: "Reach is the number of people aged 15+ who tune to a radio station within at least 1 quarter-hour period over the course of a week. Respondents are instructed to fill in a quarter-hour only if they have listened to the station for at least 5 minutes within that quarter-hour. Between 00.00-06.00, listening is recorded in half-hour periods."